Henderson is a city in Clark County, Nevada. 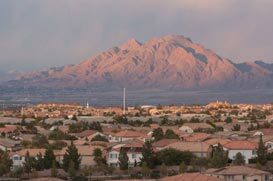 The city is part of the Las Vegas metropolitan area, which spans the entire Las Vegas Valley. Being the second largest city in all Nevada, it has an estimated population of approximately 257,729. In 2011 Forbes Magazine ranked Henderson the second safest place to live in the nation! This is attributed to the high median income and amenities catering to local residents. As you drive through Henderson you can see why people love the sophisticated suburban feel. Beautiful custom made homes are lined with manicured front lawns. Palm tree lined streets and gorgeous two story homes overlook man made lakes. People also enjoy the fact that Henderson is very close to Las Vegas. Some of the points of interest that bring people to Henderson are: Lake Mead, Galleria at Sunset, The District at Green Valley Ranch, Lake Las Vegas, Sunset Station, M Resort, Ethel M Chocolate Factory, Clark County Heritage Museum, Rio Sacco Golf Club, Eldorado Casino, Railroad Pass Casino, Jokers Wild Casino, Las Vegas Wash, Black Mountain, Ethel M Botanical Cactus Garden, Mount Charleston, as well as hiking trails such as the River Mountain loop trail. It is the perfect place to call home.